The Pelican Hard Case is durable, virtually unbreakable, watertight, corrosion proof and chemical resistant. This case offers the best protection against impact, vibration or shock. 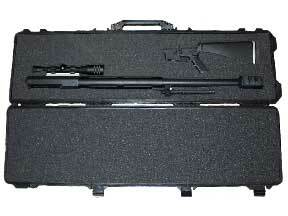 Each case is custom fit for your ALS 50 BMG. The case comes with transport wheels for better handling. The safest way to ship your new investment is in the sleek looking Pelican Hard Case. 50-1/2" x 13-7/16" x 5-1/4"
53" x 17-7/16" x 6-1/16"